"To process something unnecessary one must first send something unnecessary". External wired communication channels are developing mainly in two directions - cost reduction and increase of availability of optical channels (top-down) and growth of throughput (bottum-up). However, the two physical carriers are not so close yet (first of all, in prices) to be involved in direct competition - in 90% of cases a character of a problem to be solved determines the technology to be preferred. Internal wired channels are switching over from specialized parallel interfaces to high-level serial packet interface (Serial ATA, 3GIO/PCI Express, Hyper Transport). It fosters a convergence of external and internal communication technologies: in future separate components of a computer case will be combined into a normal network. It's quite a logical solution - a modern chipset, thus, works as a network switch equipped with multiple interfaces such as a DDR memory bus or a processor bus and AGP/PCI. BlueTooth - a wireless interface of a low throughtput for peripherals and communication between objects located not very far from each other. 802.11a / 802.11b - a standard Ethernet network with a common medium for developing a general-purpose network infrastructure. The BlueTooth and its followers will free your workplace from cables replacing them with multiple low-speed peripheral interfaces (keyboard, mouse, undemanding scanner or printer, IrDA). The 802 standard will play a role of the "last network interface" connecting the infrastructure and end access points. The first type of the 802 standard has a high throughput, over 50 Mbit, and is primarily meant for saturated and compact networks of enterprises and offices. The base frequency (5 GHz) penetrates much worse into neighboring rooms than 2.4 GHz of the 11Mbit standard. The 802.11b standard is a match for home and various residential and public structures such as airports, cafes, cinemas, trade houses. Cellular communication standards, including the struggling 3G, are the candidates for a wide territorial data transfer standard. But the widespreading 802.11 can make problems for the third generation of cellular networks as their niches overlap a lot. A bandwidth must satisfy the needs of drives, i.e. it must be 10-100 times wider than that for the infrastructure. Operation both at short and mid-range distances to cover not only intrasystem communications but also the infrastructure niche of the 802 standard and the niche of external peripherals. Much lower cost of implementation - lower than for the 802 and BlueTooth. Simplicity of realization - possibility to develop single-chip solutions that do not need any additional discrete and analog parts or even integration of such solutions into highly integrated general-purpose chips. The UWB is above and the traditional modulation is below which is called here Narrow Band (NB), as opposed to the Ultra Wideband. On the left we can see a signal on the time axis and on the right there is its frequency spectrum, i.e. energy distribution in the frequency band. 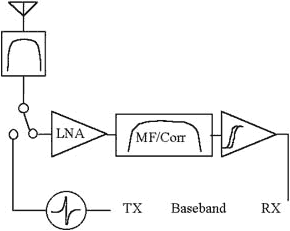 The most modern standards of data transmission are NB standards - all of them work within a quite narrow frequency band allowing for just small deviations from the base (or carrier) frequency. 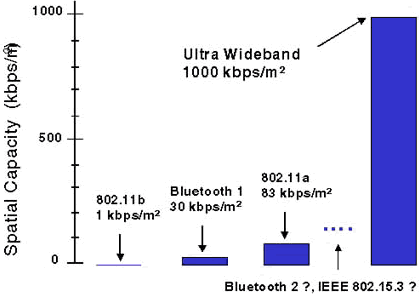 Below on the right you can see a spectral energy distribution of a typical 802.11b transmitter. It has a very narrow (80 MHz for one channel) dedicated spectral band with the reference frequency of 2.4 GHz. Within this narrow band the transmitter emits a considerable amount of energy necessary for the following reliable reception within the designed range of distance (100 m for the 802.11b). The range is strictly defined by FCC and other regulatory bodies and requires licensing. Data are encoded and transferred using the method of frequency modulation (control of deviation from the base frequency) within the described channel. So, the most part of energy of the UWB signal falls into the frequency range from 3.1 to 10.6 GHz, and the energy spectral density doesn't exceed the limit determined by the Part 15 of the FCC Regulations (-41dBm/MHz). Below 3.1 GHz the signal almost disappears, its level is lower than -60. The more ideal the form of a pulse formed with the transmitter, the less the energy goes out of the main range. But however that may be, the permissible deviation of the pulse from the ideal form must be limited, hence the second purport. The spectral range lower than 3.1 GHz is avoided not to create problems for GPS systems whose accuracy of operation can suffer a lot from outside signals even if their density is lower than -41. That is why 20 dBm (up to -60) were reserved in addition at the spectral range up to 3.1 GHz; it is not obligatory but it seems to be welcomed by military bodies. Density of transferred data able to coexist on the same square meter is much higher for the UWB compared to the popular NB standards. That is, it will be possible to use the UWB for the intrasystem communication or even for an interchip communication within one device! Most frequencies are not used all the time. That is a low frequency effectiveness of the spectrum utilization. Guard channels necessary for NB modulations (gaps between channels to eliminate pickups). That is a low frequency effectiveness of the spectrum utilization. Excessive and, as a rule, uncontrolled power of transmission (and, therefore, transmission range) of signals even if a distance is quite short. That is a low spatial effectiveness of the spectrum utilization. Whatever direction we are looking into nothing seems to be good - so, it's high time to start improving methods of radio communication and division of the air. 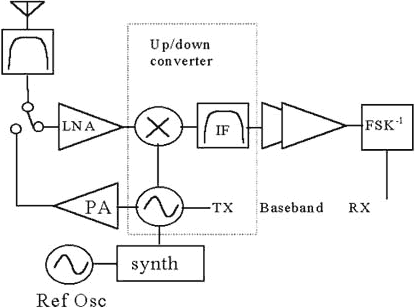 The classical transceiver contains a reference oscillator (synth) which, as a rule, is stabilized with some reference crystal element (Ref Osc). Further, in case of reception this frequency is subtracted from the received signal, and in case of transmission it is added to the data transferred. For the UWB the transmitter looks very unsophisticated - we just form a pulse of a required shape and send it to the antenna. In case of reception we amplify the signal, pump it through the band filter which selects our working spectrum range and... that's all - here is our ready pulse. The only problem is how to detect it! Here is the key how to increase the effective distance for the UWB. Of course, it's much more difficult to detect a single pulse than a series of oscillations of the carrier frequency. So, for the UWB to succeed we must create not only keys (pulse oscillators) of a strictly defined form and a switch time of around 3 GHz, but also develop high-quality detectors of such pulses which is a loads more complicated problem. However that may be but the UWB is much simpler than NB transceivers and can be entirely assembled on a chip. The most important advantage is that a UWB transmitter needs no its analog part - a signal can be sent to the air right from the chip, and in case of reception this analog part is much simpler and can be realized within the frames of not only hybrid technologies but also base ones, i.e. CMOS and the like. 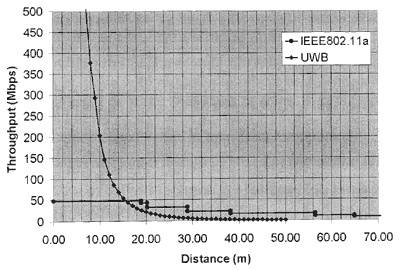 One more interesting aspect of the UWB comes from radio location (where wideband technologies were most often used before): a potential possibility to create networks able to define geometrical positions of objects. It requires sets (grids) of antennae which are very easy to make for the UWB. It can be very useful for addressing objects - just imagine a universal control radio console which knows which device it is aimed at at the given moment. One more application is creation of a dynamic antenna directivity diagram to improve reception of signals from a definite device, ignoring signals from others. This approach is going to improve even more the spatial effectiveness of the air utilization. The first standards and products based on the UWB will be available in 2005.